Guess what? 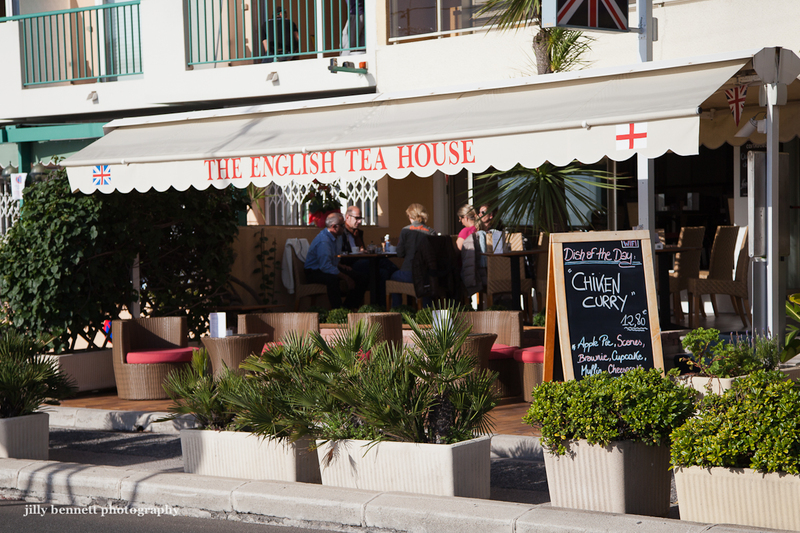 There's now an English Tea House in Menton and it's great! A fabulous choice of teas, delicious home-made cakes and scones - they do lunches too - speciality beers, wines. It was morning so we had coffee (a cappuccino and a noisette), served with tiny pieces of cake, water in glasses with non-slip sides and a perfect view of the sea where you can watch others running along the promenade whilst you indulge. The hand belongs to my friend Anne whose only exercise was to stir her coffee. For lunch you can have delights like bangers and mash. 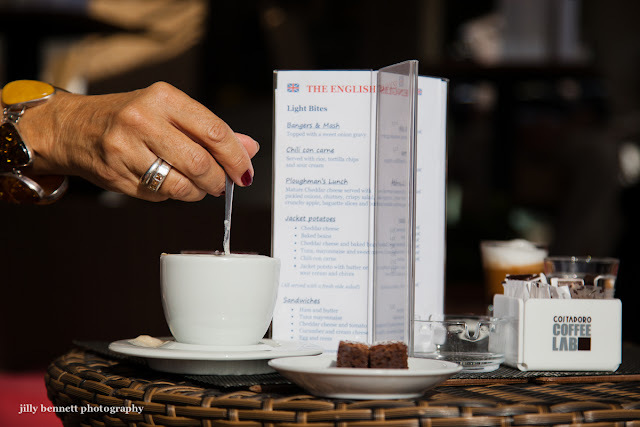 Imagine bangers and mash (real English sausages too) in Menton! Devinez quoi? Il y a maintenant une Maison de Thé Anglaise (The English Tea House) à Menton et c'est génial! Un choix fabuleux de thés, de délicieux gâteaux faits maison, des scones. On sert aussi à déjeuner - bières spéciales, vins. 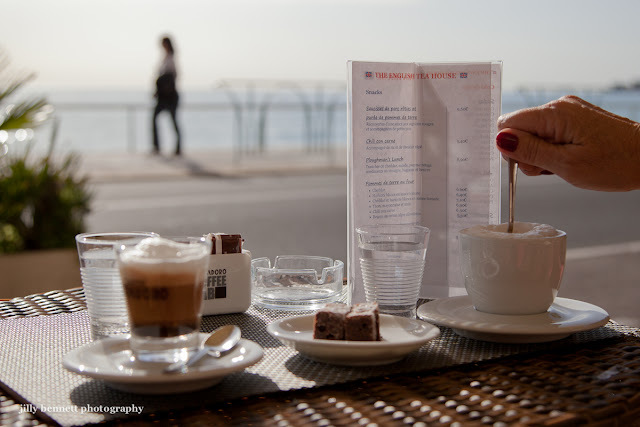 C'était le matin si nous prenions les cafés (un cappuccino et une noisette), servis avec des petits morceaux de gâteau, de l'eau dans des verres avec côtés anti-glisse et une vue parfaite sur la mer où nous pouvions regarder les gens courir le long de la promenade pendant que nous étions à notre aise. La main appartient à mon amie Anne, dont le seul exercice consistait à remuer son café. Pour le déjeuner, vous pouvez choisir un délice comme ' bangers and mash.' Imaginez bangers and mash (véritables saucisses anglaises et pommes de terre e n purée) à Menton! Guess this would quickly turn into my regular hangout! perhaps stirring is anne's only exercise but she does it splendidly. It looks nice, but I think the owners are not English by the way they spell Chicken..
How civilized. Well, not bangers and mash but rather the whole ambiance: Earl Gray with a perfect scone and a view of the Mediterranean. Kim, I'll look out for that studio. Thanks a lot. Glad you enjoyed Gorbio. D, It's owned by father and daughter - father is French, daughter is French too but born here to an English mother, who is sometimes there too. Hence the English influence. Thanks so much to your friend Anne for providing the lovely hand stirring the coffee and congratulations to you for directing her - your photo is absolutely perfect with sea, passing lady along the waterfront, glistening sun on the cup and spoon, assortment of goodies, great composition and lighting. Jilly you're getting damn good at photography and I think the English Tea House should pay you as their official photographer.